Lisabeth Lewis has a black steed, a set of scales, and a new job: she's been appointed Famine. How will an anorexic seventeen-year-old girl from the suburbs fare as one of the Four Horsemen of the Apocalypse? Traveling the world on her steed gives Lisa freedom from her troubles at home--her constant battle with hunger, and her struggle to hide it from the people who care about her. But being Famine forces her to go places where hunger is a painful part of everyday life, and to face the horrifying effects of her phenomenal power. Can Lisa find a way to harness that power--and the courage to fight her own inner demons? 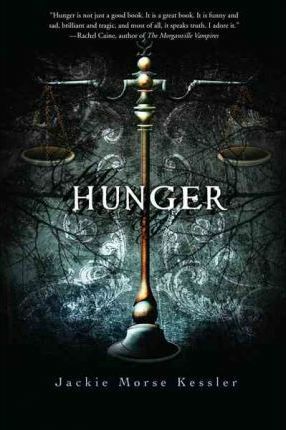 A wildly original approach to the issue of eating disorders, Hunger is about the struggle to find balance in a world of extremes, and uses fantastic tropes to explore a difficult topic that touches the lives of many teens. PRAISE FOR THE RIDERS OF THE APOCALYPSE SERIES Praise for Hunger: An ALA Quick Pick for Reluctant Young Adult Readers* "Realistic and compassionate. . . . the writing is never preachy, and it allows an interesting exploration of both intensely personal food issues and global ones." --SLJ, starred review"Jackie Morse Kessler does a fine job of taking a critical issue that has been explored in writing no small number of times, and putting a new and thought provoking spin on it. . . . Sheer genius." --New York Journal of Books"Powerful, fast-paced, hilarious, heart-wrenching. . . . This story will grab the reader and never let go." --Romantic Times Magazine"Hunger is not just a good book. It is a great book. It is funny and sad, brilliant and tragic, and most of all, it speaks truth. . . . I adore it." --Rachel Caine, author of The Morganville Vampires"A fantastic and gripping read that never shies from its difficult subject matter. . . . This book is a knockout." An ALA Quick Pick for Reluctant Young Adult Readers "Rage is raw and real, a truly dark, honest look at self-harm and the teenage psyche. Kessler left me breathless." --Heather Brewer, author of the New York Times bestselling series, The Chronicles of Vladimir Tod"The elegant mix of dark humor, brilliantly developed characters, and just enough moral threads to lead readers to make their own conclusions is impressive." --Bulletin "Raw, visceral, pulling no punches, this story strikes home like a razor blade. It's unforgettable, heart wrenching, and enlightening." --Realms of Fantasy Praise for Loss: "Kessler blends fantasy, history, humor, and hard reality into a gripping tale." --SLJ "Jackie Morse Kessler has a keen eye for capturing the awkward uncertainty of adolescence, which she wraps quite deliciously in a coating of mystery, fright, and suspense. Loss is a treat for readers, a one-of-a-kind, twisty turny carnival ride. . . . I loved this book." --Andrew Smith, author of The Marbury Lens "Whip-smart and elegant." --Saundra Mitchell, author of The Vespertine"Gritty and raw with powerful truths. An addictive read." Praise for Breath A Junior Library Guild Selection "A riveting read." --Kirkus Reviews"The series is a strong and unique attempt to encourage troubled teens to consider their options and accept the help they need, while exposing all readers to the pain their friends may be experiencing."